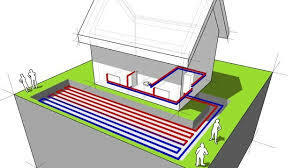 Solar energy accrues/accumulates in your property´s underground all year round. A circuit of pipes, buried at 1 to 1.5 meters underground, absorbs geothermal energy, then connected to a heat pump transfer the energy to the heating system in the house and subsequently head the chilled fluid back to the circuit below the surface. This system runs on electricity being 100% reliable. This energy can provide heating and hot water in your home. Up to 100% heating energy at 25% of operational energy cost. Geothermal heat can be part of hybrid or combined systems along with solar heating / solar panels, solar cells and wind turbines.